The upcoming OCG 2016.04 has hit Performapal Dracoslayer pretty hard. Performapal Monkeyboard is forbidden, while Performapal Skullcrobat Joker, Performapal Pendulum Sorcerer, Luster Pendulum, the Dracoslayer, Ignister Prominence, the Blasting Dracoslayer and Draco Face-Off are limited. This results in Performapal Dracoslayer losing consistency and its ability to generate card advantage. While most players have abandoned Performapal Dracoslayer, two innovative Japanese players have found success with Performapal Odd-Eyes Dracoslayer and Odd-Eyes Magician Dracoslayer. 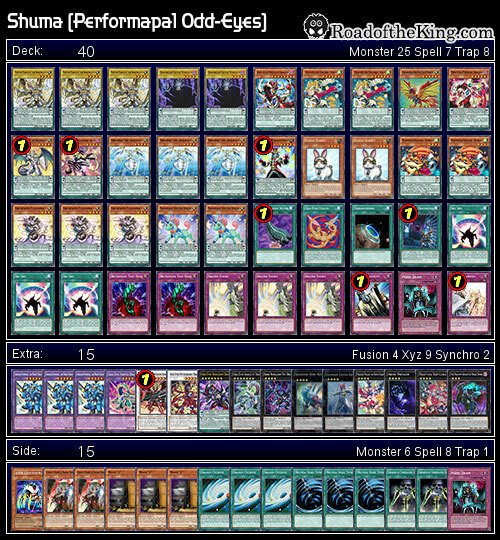 Shuma (しゅーま) went 6-2-1 with his Performapal Odd-Eyes Dracoslayer. Using the OCG 2016.01 Performapal Dracoslayer as the skeleton build, Shuma chose to replace the cards affected by the Forbidden and Limited List with Odd-Eyes support. With only 1 of each Performapal Skullcrobat Joker and Performapal Pendulum Sorcerer left, the Performapal engine is not as dominant as before. Instead, Performapal Odd-Eyes Unicorn and Performapal Odd-Eyes Light Phoenix were ran instead, giving Shuma the ability set up Pendulum Scales of 3 to 8. Those scales are sufficient to Pendulum Summon Level 4 monsters, while enabling Level 7 monsters as well. To double up on the consistency, Shuma ran a full playset of Sky Iris to fetch Performapal Odd-Eyes Unicorn and Odd-Eyes Persona Dragon. Sky Iris can also fetch Odd-Eyes Fusion, allowing Shuma to summon an Odd-Eyes Vortex Dragon when the opportunity arise. A pair of Majespecter Unicorn – Kirin and a pair of Majespecter Raccoon – Bunbuku finish up the deck and acts as recurring threats. 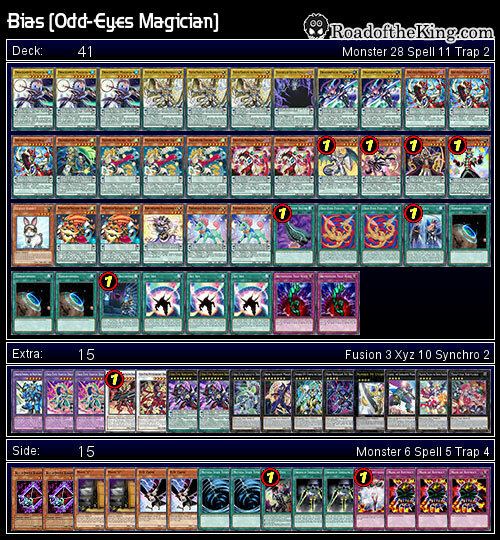 Bias (ばいあす) went 6-3 with his Odd-Eyes Magician Dracoslayer. Bias’ build is a reminiscence of the Magician deck that was briefly popular during the Asia Championship 2015. Rather than banking on Rank 4 Xyz monsters, Odd-Eyes Magician leans more towards summoning Rank 7 Xyz monsters instead. In addition to Performapal Odd-Eyes Unicorn and Odd-Eyes Persona Dragon, Dragonpulse Magician and Dragonpit Magician doubles up as Pendulum Scales of 1 to 8. Running light on traps, Odd-Eyes Magician depends on Odd-Eyes Fusion to bring out Odd-Eyes Vortex Dragon and establish a soft-lock on the opponent. If you are looking to convert your Performapal Dracoslayer to fit the OCG 2016.04 format, Performapal Odd-Eyes Dracoslayer is a reasonable choice with minimal changes. Odd-Eyes Magician Dracoslayer is another option with more reliance on the Odd-Eyes engine. The new OCG 2016.04 metagame seems to be shaping up towards Phantom Knights Burning Abyss and Blue-Eyes, so some slight adjustment might be necessary to keep up with the metagame.